• The adapter offers molded-strain relief for flexibility at the connection points, reducing wear and tear from frequent use. A white label helps you identify which end is up for easy, quick insertion. • Measuring 5 inches, the adapter is a pocket-sized, portable accessory for HDTV setups both at home and in the office. 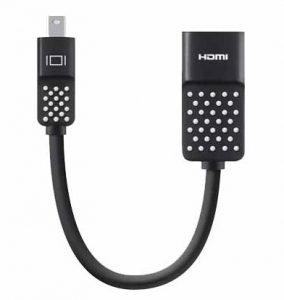 When used with an HDMI cable (sold separately), the adapter offers plug-and-play capability that is ideal for presentations on the go.